This is an unusual find for one of my favorite series of Jeffersons! 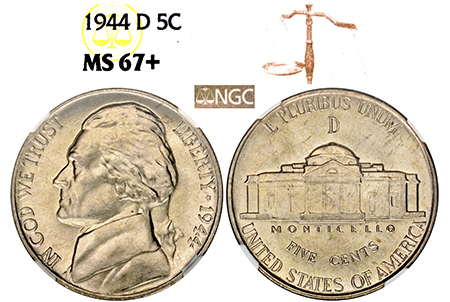 The Silver War Nickel was only produced from 1942-1945! I rarely find an example that has this kind of blast-white, virtually flawless eye-appeal! Smooth surfaces make it seem unlikely this is a Mint State, and combined with the luster of this coin, its stunning beauty makes it a poster-child for War Nickels. NGC has graded 1,982 examples in MS 67; however, just 4 have been graded MS 67 PLUS, and only 11 have been graded higher! This is an attractive and scarce find!